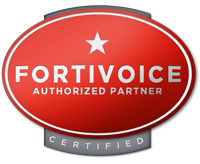 Computers, Inc. is a proud reseller of FortiVoice Small Business Phone Systems formally known as Talkswitch. Let our team of technicians evaluate, advise, and implement the best possible business telephone solution for you! The FON-550i is a premium phone for power users. This phone can be custom tailored with 22 programmable, multicolored LED appearance keys, and optionally expands up to 46* for attendants. And for unprecedented wireless flexibility, add the optional Bluetooth module. 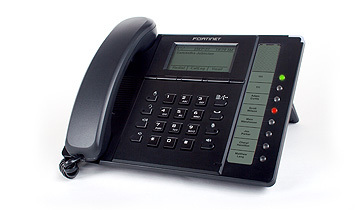 It's the most sophisticated FortiFone telephone. 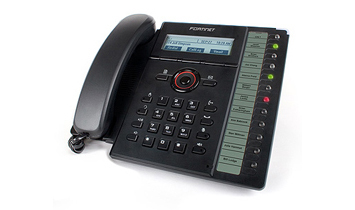 The FON-450i is a premium phone with 10 programmable, multicolored LED appearance keys (optionally expandable up to 34), superior audio quality speakerphone, dedicated headset support and more. Two 10/100 Mbps Ethernet ports minimize LAN drops per desk. PoE support eliminates the requirement of a power adapter. Auto detection and provisioning for a fast and easy setup. 10 programmable multicolored LED programmable appearance keys (expandable to 34 with optional expansion module) provide maximum flexibility for each user. Dedicated headset support for use with any amplified headset with an RJ-22 connection. Multilingual support (English, Spanish, French). Adjustable angle and display contrast. 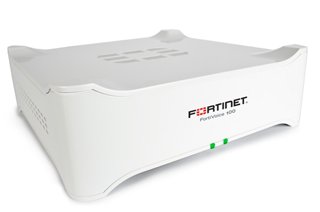 The FON-360i is a powerful business workhorse that fits a wide range of users. It features six programmable multicolored LED appearance keys, superior audio quality speakerphone, dedicated headset support and more. 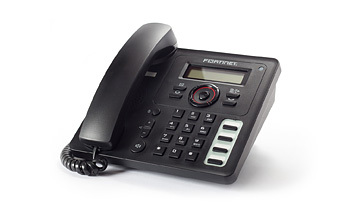 The FON-260i is a simple, stripped-down IP phone for users who don't need all the bells and whistles. No blinking line appearance lights, no complications, just dial it and talk. Great for courtesy phones in reception areas or for staff with low feature requirements. 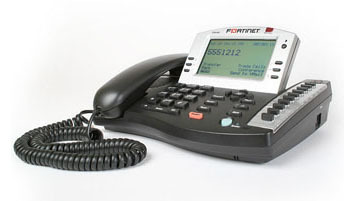 Works with all FortiVoice and TalkSwitch VSX phone systems. 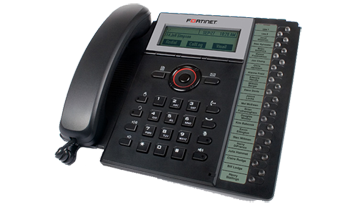 A premium analog business speakerphone, the FON-600 features a large adjustable backlit LCD display, a sleek, user-friendly interface and versatile programmability. This telephone set offers superior sound quality and sleek headset integration, with two headset ports and a built-in amplifier. The impressive display is easy to read for enhanced efficiency.